| ABOVE x BELOW | My obsession with houseboats intensified when I was here, they are so beautiful and so efficiently put together that I could have given up everything to live in this city and on a houseboat. But I also was loving the adorable Apartment/Home buildings around town, as they have so much charm, they reminded me of doll houses. | ABOVE | I snapped a picture of this cool bike that I wish I had, mainly for display because I don't like motorbikes in general, but this one was vintage and you all know how much I love vintage! | BELOW | The love for beer became real in Amsterdam, the beer is so damn good, it was dangerous. Nothing like a cold beer after walking hours on end. Look at the cuteness of a dog taking a nap, I believe he was the restaurant owner's dog as he knew his way around the place pretty well. | ABOVE x BELOW | Details of what was once the humble abode of one the greatest painters of European art and most influential in Dutch history, Rembrandt Harmenszoon van Rijn. He lived here in the mid 17th century, but after he was unable to pay the debt of the house, he lost it and was forced to move to a rented place where he lived up until his death in 1669. Between 1660-62 the house was split in two and housed several families up until the 19th century. The house was altered several times and was left in such poor conditions that if it was not that it once belonged to such an important figure it would have been demolished. The City of Amsterdam, bought the home and handed it to a foundation built to restore the home, the trustees of this foundation reconstructed the home and Queen Wilhelmina opened the doors in 1911 as a museum. 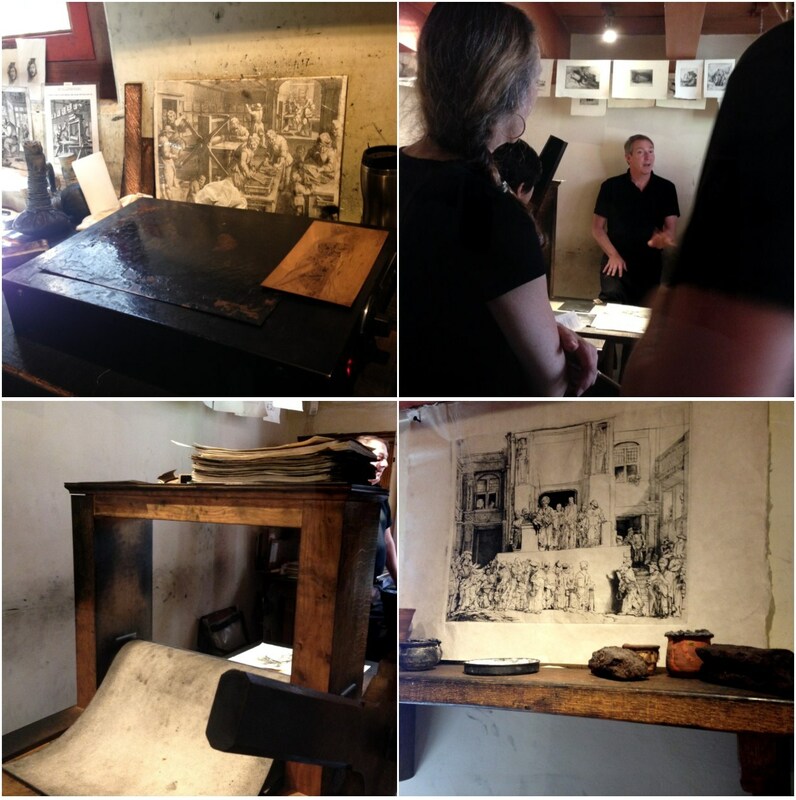 | ABOVE x BELOW | Etching demonstration in Rembrandt's printing room. Replicas of Rembrandt's famous etchings hang in the room below the ceiling. | ABOVE | Rembrandt's collectibles that he garnered during his travels around the world. I really wanted every piece of artifact in this room, such a cool collection, look at all those head statues...amazing. | ABOVE | Rembrandt's restful little nook, a.k.a his bed. | BELOW | The kitchen was also a pretty cool room, so different then the kitchens we know now. | ABOVE | The Famous De Wallen, Red Light District, where you can see all sorts of things even in broad daylight. What I was slightly surprised about was the casual demeanor in which it all takes place, it was almost refreshing. The district is busiest at night of course, with an array of different age groups and people. We had walked through the area several times not realizing it was the Red Light District until we reached the main street and noticed the ladies on the windows. | ABOVE x BELOW | A Guided Boat tour around the canals, which I recommend because you get to see the beautiful houseboats and much of the city, plus it's very relaxing. You also get to see the amazing architecture, which has to be one of my favorite things about this city aside from the houseboats of course. | ABOVE | Again, I couldn't resist taking photos of the charming buildings that hug this city, can you spot the crooked house? | BELOW | Having some gin and tonics on our last night at a bar that is housed in one of the oldest building in Amsterdam. Hope you enjoyed the last post coverage of my trip to Amsterdam back in July. 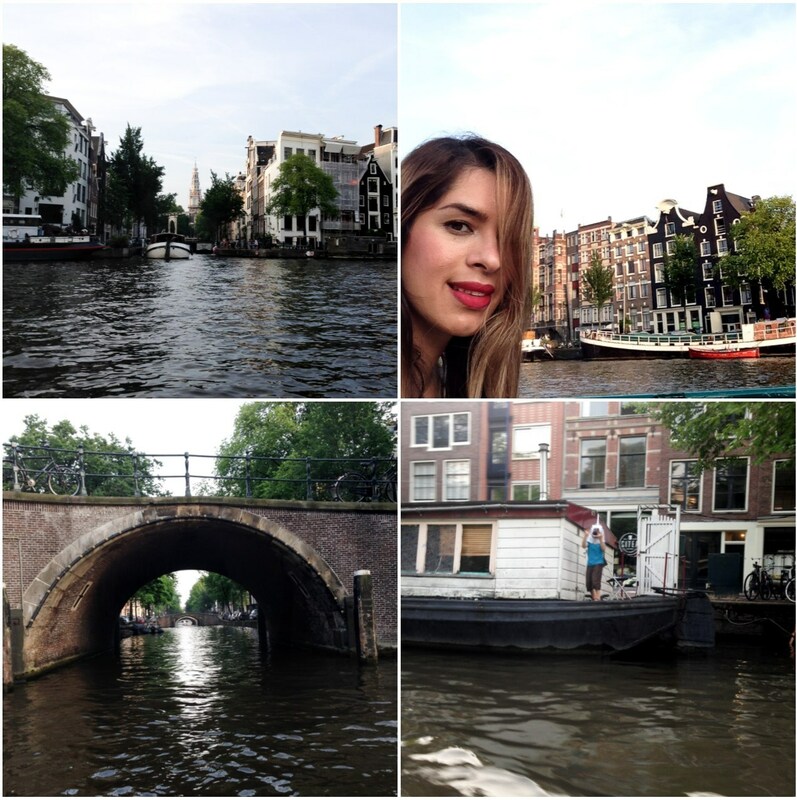 It was a fantastic experience, I fell in love with this city so much, I saw myself living there. My husband and I definitely want to go back to be able to see more, as it was a short trip, especially that we did not get to go to Anne Frank's house, which was at the top of my list of things to do. The city is easily accessible by foot, so there is really no need for a bike, trams or buses, although it would be a fun and interesting experience with a bike as they take their bike-riding very seriously there. They even have a parking lot just for bikes, which I tried to capture but the photos were a little blurry as I tried to capture while we were on the boat tour. If you ever go, I would love to hear your experience! Next up on my Chic Travels series is my honeymoon, so stick around for that, as it will be coming in the next few days. Gorgeous! Experiencing serious travel envy right now. Thank you ! you have to add it to your travel list !